To help you out, I came up with three easy tips to pull together a healthy, quick, and balanced meal using whatever you have in your refrigerator and pantry. 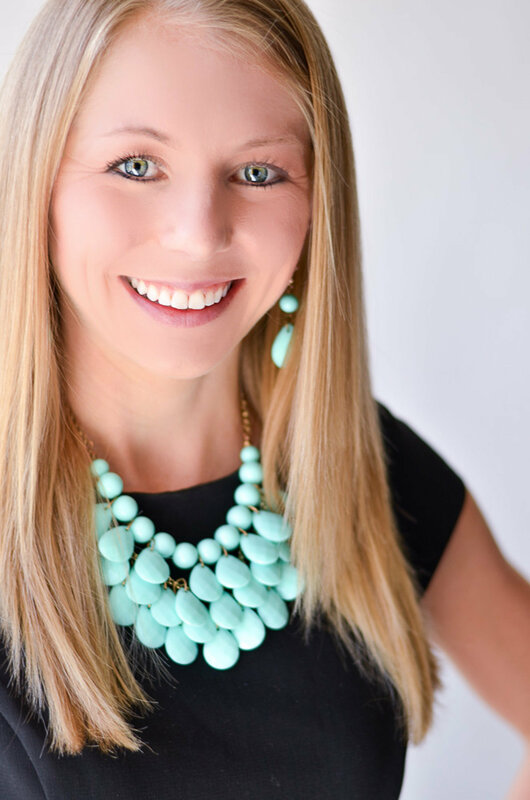 Introducing … the MVP Rule! Carbohydrates: provide energy to your body, muscles, and brain. Your body needs carbohydrates, and while limiting them works for some people, there’s no reason to avoid them completely as several “fad diets” would have you do. It is healthier, though, to focus on unprocessed, natural forms of carbohydrates, and if you are going to have grains, look for whole grains over white, processed grains. Fibrous foods are also a source of carbs, and your body loves fiber for healthy digestion, weight control, blood sugar control, and disease prevention! Fat: do not be afraid of fat, please! Not only is fat the most satiating macronutrient (it helps you stay full! ), but it is also the most efficient energy-providing macronutrient, and is necessary for many, many of your body’s critical functions (like vitamin absorption, growth and development, and cell function). Protein: critical for your body’s growth, muscle/ tissue repair, and muscle mass preservation, protein is a healthy eater’s dream. It helps a meal feel substantial, keeps you full and energized, and powers your body as it gets stronger and faster! So what should you do to plan your healthy dinner? Make sure you get a balance of macronutrients, and look for each one of them in every meal. Good sources of carbohydrates are fruits, vegetables, and whole grains … so toss in whatever veggies you have in your fridge, add some quinoa or brown rice, or serve squash or sweet potatoes on the side. Good sources of healthy fats are nuts, seeds (like sunflower, chia, or flax), avocados, oils, and fattier fish … so add one as an accent to your meal. Good sources of protein are chicken, fish, lean meats, tofu, tempeh, beans, dairy (like Greek yogurt or milk), and eggs … so make sure your meal includes at least one of these. Vegetables – I’ve talked many times about the power of vegetables, so I won’t belabor the point now. Vegetables are not only chock-full of disease-fighting antioxidants, but they’re filling, high in fiber, and delicious. So what should you do to plan your healthy dinner? Simple … pile them on! Don’t fall into the trap of thinking you have a small portion of corn, potato, or other starchy vegetable on your plate, so your “vegetable” box is checked. Instead, look for a variety of colors and flavors, and include as many as you can! Here are Cooking Light’s 12 tips for sneaking in more fruits and veggies. 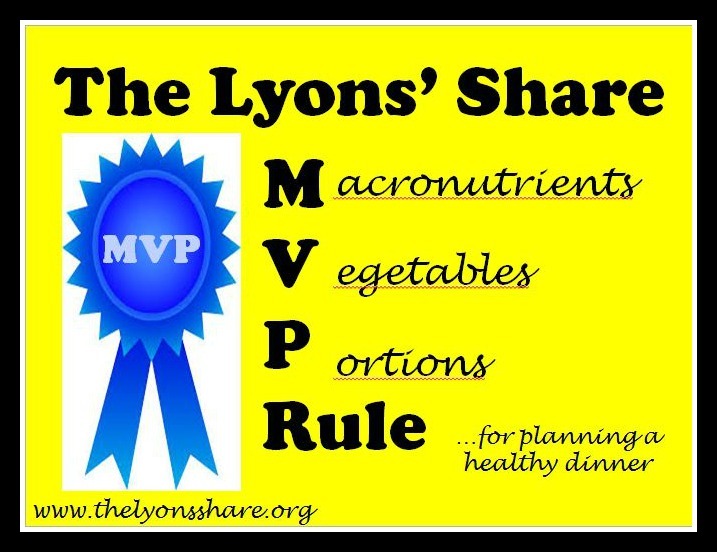 Portions – So many people who think they’re eating the healthiest diets but are struggling to lose weight are just mis-estimating their portion sizes! It’s hard to give guidelines for this one, because it’s SO dependent on each individual – how active they are, what gender/ age/ weight they are, how their body uniquely metabolizes food and what kind of diet works for them. But being mindful of your portion sizes is a great first step! So what should you do to plan your healthy dinner? Be reasonable about the portion sizes that you need for your activity level and goals. Just work on mindfulness and being honest with yourself. If you struggle with portion sizes, reduce your plate size – in a study published by Cornell, people served in larger bowls ate 16% more than those who ate out of smaller bowls, but underestimated their consumption by 7% more than the smaller bowl group! If I reflect on some of my favorite quick-and-easy meals that I resort to when I have no other plans, the first two things that come to mind are my favorite breakfast and my Ugly Secret (both of which I’ve eaten in the past 24 hours!). My breakfast has carbohydrates (pumpkin, fruit, oats), fats (chia seeds, almonds), and protein (Greek yogurt). It even has a vegetable (pumpkin), and is the perfect portion for me – fills me up and keeps me energized, but doesn’t leave me feeling weighted down. My Ugly Secret has carbohydrates (TONS of veggies!, tomato sauce, and added quinoa or squash if I need more carbs that day), fat (parmesan and often avocado), and protein (depends on what I have, but usually a veggie burger, tofu, or chicken). It’s loaded with veggies, and I can tailor it to the size that works for me on that day. Now, it is Foodie Friday, and I have been sorely lacking in my recipe posts lately (sorry!). Last weekend, I created a genius recipe for Peanut Butter and Banana Muffins, with no added sugar, no gluten, and no oil! 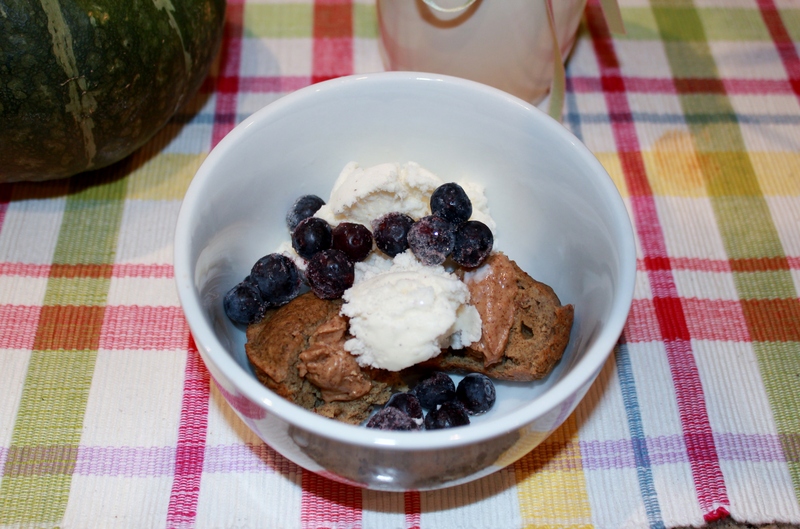 I topped a warm muffin with almond butter, blueberries, and vanilla ice cream, and I loved every bite …. until I gave Kevin a bite, and he said it tasted like FEET (hey, at least he’s honest!). I tried them again the next morning, and while they did NOT taste like feet, they weren’t blog-worthy, so I’ll spare you the details! 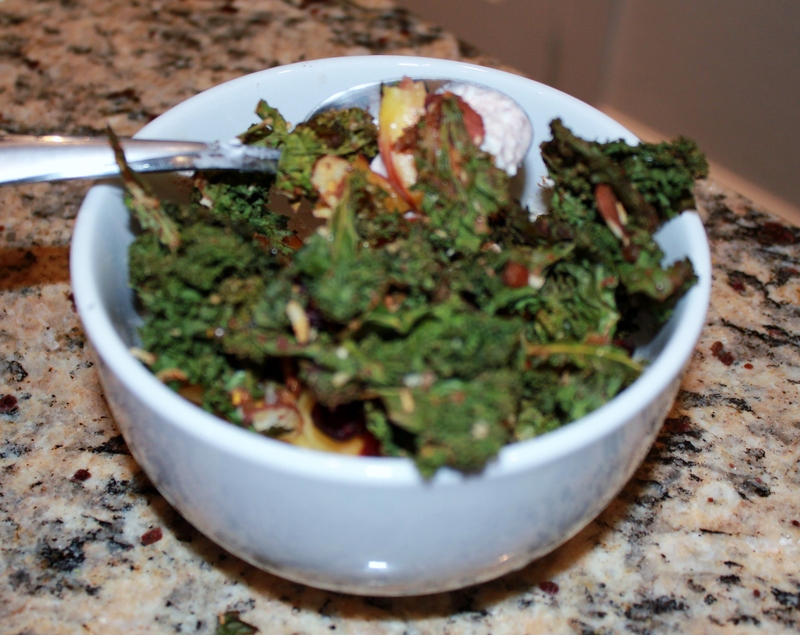 Berry Almond Kale Granola (from Eating Bird Food): kale sweetened with mango and dates, alongside dried berries, coconut, and almonds? Sign me up! 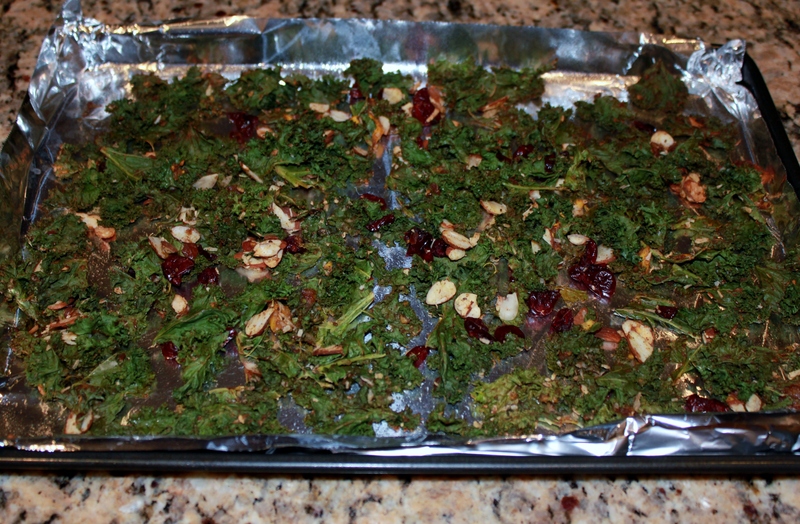 While I wasn’t patient enough to let mine get super crispy, I adored the sweet flavor and LOVED the idea of using kale in a non-traditional way! Tofu and Jicama Nachos (from Sprint2TheTable): after seeing roasted jicama all over STUFT Mama and Sprint2TheTable‘s blogs, and seeing a huge jicama at my Farmer’s Market, I knew I needed to try this. I added mushrooms, and topped the nachos with an impromptu “vegan cheese sauce” of nutritional yeast, tahini, lemon juice, water, cayenne, and cumin (I don’t know where I come up with this stuff!). The nachos were fun to eat, nutritious, and delicious! Cauliflower (and spinach) Protein Pancakes (from Sprint2TheTable): cauliflower is getting a lot of attention in the blog world lately, so I had to cash in on these creative, fluffy pancakes. I doubled the cauliflower and added spinach, and while I admit you could taste the veggies, I’ve never been one to turn down my veggies, so I loved every bite! 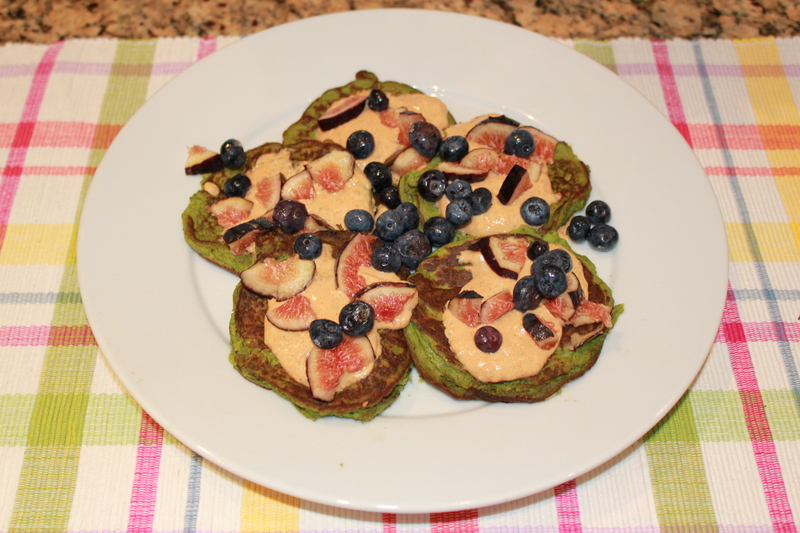 I topped mine with pumpkin chia yogurt, blueberries and figs – delicious! So tell me in the comments … what are your “go-to” rules for putting together a healthy dinner? Will you remember the “MVP Rule”? What’s for dinner tonight? Meg: The real question raised by your blog entry today is, “How does Kevin know what feet really taste like?” I am sure we have a picture of him from his first few years on this planet sucking on his toes. It will go viral as soon as I find and post it! Ah meal-planning. Since I feel like I am constantly planning or eating food recently, I’m all over this! My plan is based on specific portions (in ounces) of Macros. For me my meals are prescribed with protein, starch, veggie, liquid fat, fruit, & avocado. Very specific! Yes, the last minute “stare at your fridge and wonder what to make” probably doesn’t work well with a competition diet! But for those who don’t have a specific plan, just thinking about trying to incorporate each macro can be really helpful! I’m so flattered you tried the nachos and the pancakes! That vegan cheese sauce is one of my go-to mixes. Cumin and cayenne pretty much go in every savory thing I make. LOL! 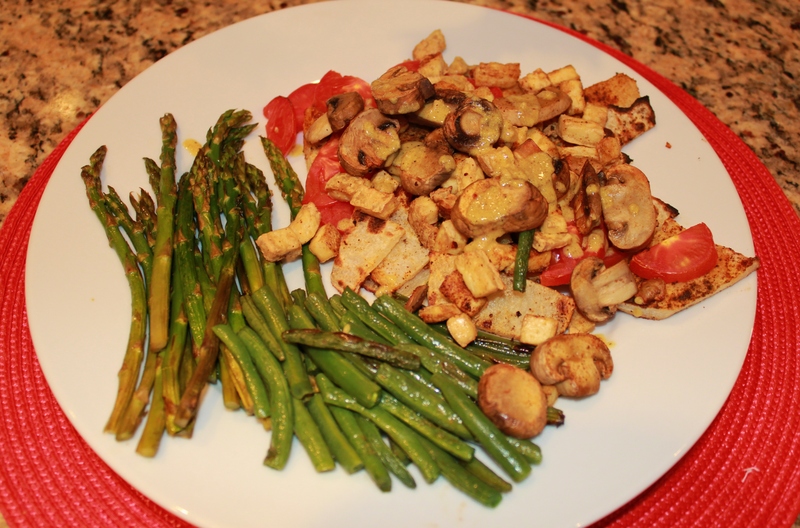 Your recipes are amazing … those aren’t the first I’ve tried and certainly won’t be the last :). I am literally in that situation right now. 6 pm, hungry for dinner but don’t have the energy to cook anything elaborate. I have lots of veggies in the fridge so pre-cooked chicken (thanks Mom!) and some leftover quinoa salad that I think I may mix all together. Usually in these situations I end up making some sort of protein pancake but I used up all my eggs in my pumpkin egg-white oatmeal this morning…I may check out pinterest and see if anything inspires me, but let’s be honest I’m probably going to mix all of the above and call it dinner. Too tired for creativity tonight! Sometimes mixing a bunch of goodies in is the best meal :). Add some interesting spices, some tomato sauce or salsa, or some avocado and call it a meal! You have a wonderful weekend as well – emailing you tomorrow morning for sure! !